For any family with junior school age children, Liz Pichon’s Tom Gates books have become a familiar and popular addition to our bookshelves. Liz has now written and illustrated fifteen books in the series, and when I mentioned to my ten year old son that Tom Gates was to be ‘Live on Stage’, he was very excited to see how that would work. Director, Neal Foster and Author, Liz Pichon agreed that rather than base the show on one of her many books, they would create a brand new story, and so in a first for the Birmingham Stage Company, they worked together to do just that. The story starts in the classroom: Tom has got three sad faces on the class achievement chart. If he gets four, he will not be allowed to go on the class outing to the local biscuit factory. At home, his grandparents (the Fossils) have decided to renew their wedding vows, and preparations are in full swing. Jackie Trousdale’s set is mainly comprised of six drop down screens that have Liz’s very stylised doodles projected onto them. These go up and down as the scenes change with amazing effect. Doors and windows appear and disappear in the blink of an eye, and the rain cloud that follows sister, Delia around constantly is very amusing. My favourite scenes involved Dad (Daniel Harkin), driving Tom and his friends around town in his borrowed hot dog van, all down to a clever projected illustration and some impeccably choreographed acting. The cast work extremely well together, many playing multiple roles to deliver a fun and cohesive script. Matthew Chase proficiently leads the cast as the titular Tom, his signature hairstyle is lifted straight from Liz’s illustrations and is a nice touch. Justin Davies and Ashley Cousins as school friends, Norman and Marcus, really capture their characters – we all knew similar people at school! Amy Hargreaves shines through as sugary classmate Amy and the emotionally charged big sister, Delia. Some of the funniest scenes involved Ashley Cousins as Granny and Matthew Gordon as Grandad. Grandad teaching Tom to play the spoons and a wedding arch made of Zimmer frames were among the highlights. Look out for the special wedding carriage, it’s very funny and brilliantly designed. The whole piece is woven with original music by Liz’s husband, Mark Flannery, with lyrics written by Liz herself. The songs are catchy and witty, and bring more fun to the proceedings. 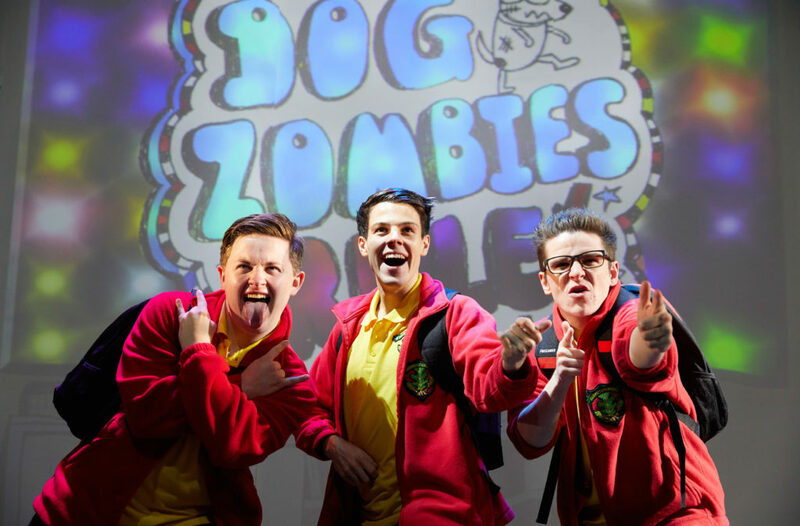 Tom Gates – Live on Stage is a joyous piece of children’s theatre – and is sure to bring a smile to old and new fans alike.